Can you identify the family in this photograph? A black and white negative of an unidentified family standing outside in front of trees. In this view the mother and father are standing behind two young boys. The parents have their hands on the shoulders of the children. 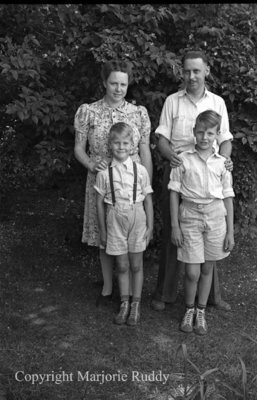 Unidentified Family, c.1945, Marjorie Ruddy. Whitby Archives, A2013_040_832A.